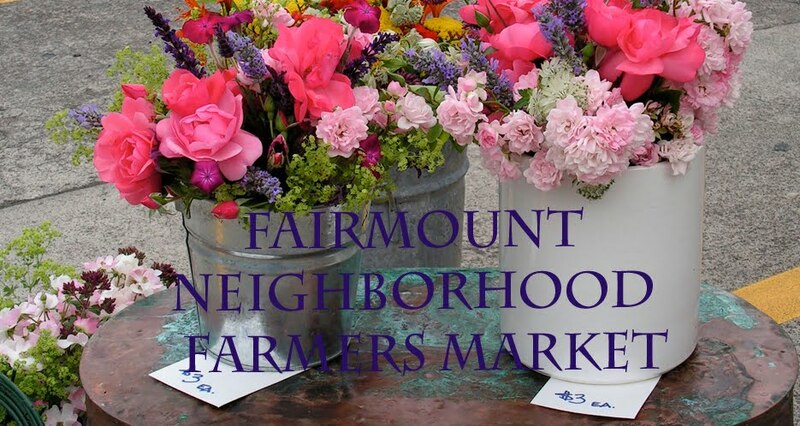 The sixth season of the Fairmount Neighborhood Farmers Market kicked off last weekend with a bounty of spring produce from Good Food Easy at Sweetwater Farm and a wide selection of pastured meats from Fair Valley Farm. 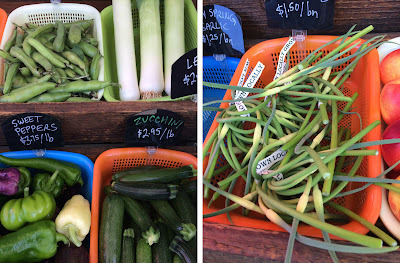 One spring treat to pick up this Sunday is a bunch of garlic whistles or scapes. Last year I discovered that these are delicious grilled in salsa, but last Sunday, since I had the oven on for baking bread, I decided to toss my newly acquired garlic whistles in olive oil and salt on a sheet pan like kale chips. I added some baby zucchini slices to the pan for the last few minutes. 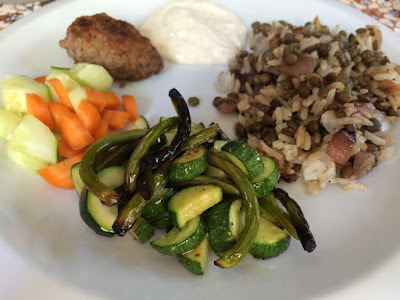 The final dish was a delicious contrast in textures, with the garlic whistles adding the perfect, subtle punch of flavor to the delicate zucchini. We had our roasted vegetable with these favorite sausages made with Fair Valley lamb, crunchy, farm fresh carrots and cucumbers, and mujaddara and spiced yogurt. It was a feast fit for celebrating the beginning of summer and the local farmers who feed us. Preheat the oven to 450 degrees and place in a sheet pan. Rinse the garlic whistles, trim off their ends, and slice into 1 1/2 inch lengths. Transfer to a mixing bowl and toss with a drizzle of olive oil and a generous sprinkle of salt. 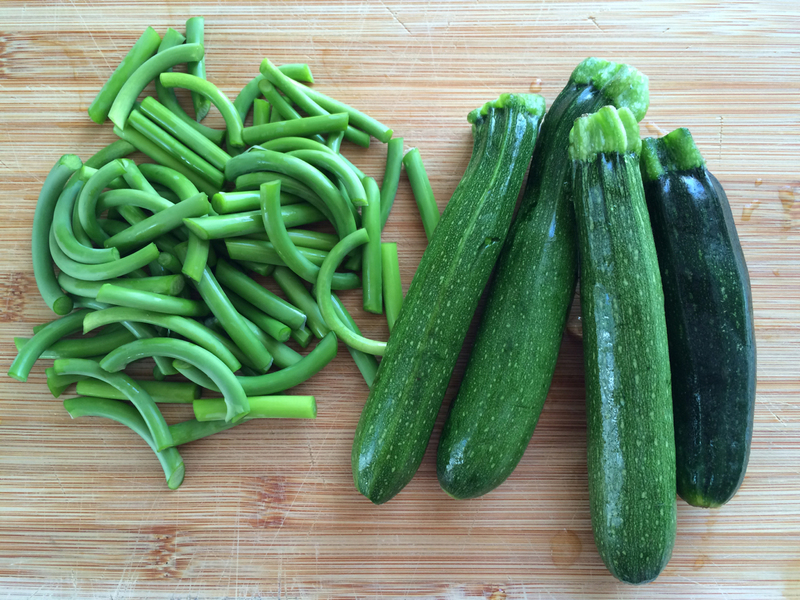 Rinse the zucchini, trim off their ends, cut in half lengthwise and cut widthwise into 1/2 inch half moons. When the oven is hot, spread the oiled garlic whistles on the hot sheet pan and return to the oven. 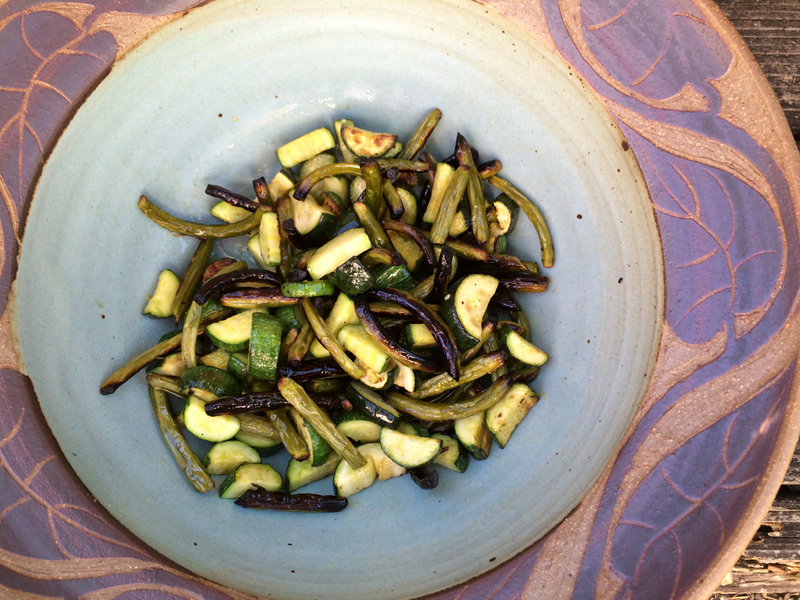 Toss the zucchini slices in the oily bowl, adding a sprinkle of salt and a bit more oil if needed to coat them. Roast the garlic whistles for about 7 minutes until they have started to char. Toss them in the pan and add the zucchini slices. Roast for another 3 minutes. Toss to flip the zucchini and roast them another minute or more if needed, until they have acquired some nice brown spots. Remove from the pan and serve.